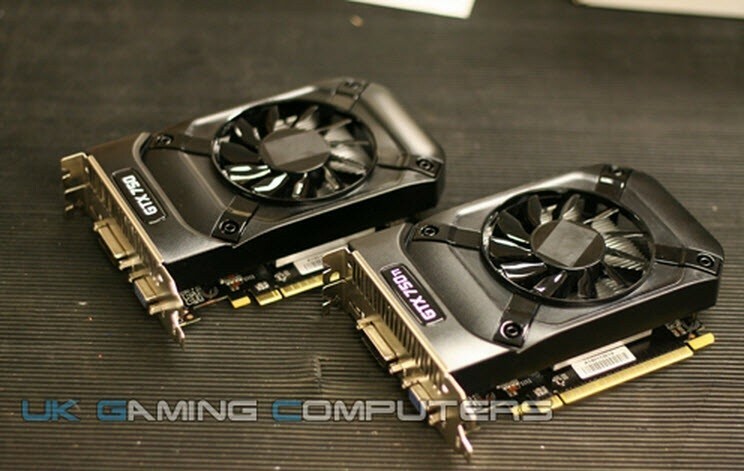 New information has leaked online relating to Nvidia's upcoming GeForce GTX 750 Ti and GTX 750 graphics cards, which are set to add to the exisiting high-end products in the GTX 700 series. Both mid-range cards have been pictured by UK Gaming Computers, alongside GPU-Z screenshots showing some specifications to expect. Both cards shown are compact, barely longer than a PCIe slot, and come with DVI, HDMI and VGA ports. The screenshots also reveal that both cards use a 28nm GM107 GPU, which is expected to be the first implemenation of Nvidia's 'Maxwell' architecture: the M in GM107 likely indicates a Maxwell part, like how K in GK107 indicates Kepler. This also corroborates with a previous report that pegged the GTX 750 Ti as the first Maxwell-based graphics card. According to UK Gaming Computers' information, the GTX 750 Ti features 960 CUDA cores, 80 TMUs and 16 ROPs, plus 2 GB of 5.50 GHz (effective) GDDR5 memory on a 128-bit bus. The GTX 750 comes with 768 CUDA cores, 64 TMUs and 16 ROPs, plus just 1 GB of 5.10 GHz (effective) GDDR5 on a 128-bit bus. Both cards have the same core clock speed, 1085 MHz, and boost clock speed, 1163 MHz. The Maxwell architecture is said to focus on power optimization, and both the GTX 750 Ti and GTX 750 don't require external PCIe power sources, meaning they can only draw up to 75 W through the PCIe bus. The cards are set to be officially released in mid-February, and no pricing information has been revealed at this stage.